OSADL members and non-members may have their computer boards tested and monitored at the OSADL QA farm. The boards must be mounted on OSADL Test Rack Tablets with standard power supply 220 V, 50 Hz, RJ45 Ethernet and serial connector. 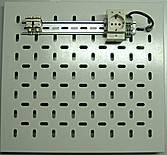 Please contact OSADL for cabling details and purchase conditions of the test tablets. Anonymous Web surfers only have have access to 30-hour latency recordings and to the most recent latency plots of the systems. The providing company has full access to all long-term data and to the failure data base. Manufacturer data and other details that may identify a board are not necessarily disclosed but may be kept confidential upon request. Whenever a new prerelease of a real-time kernel or a "Latest Stable" kernel is available and the kernel does not require any individual patching, OSADL will upgrade the board to it. Should a kernel not run as expected, OSADL will fix it as long as the problem probably is related to a core kernel component. If the problem obviously is related to a specific property of the hardware, the previous kernel is used and the providing company is notified. OSADL may then help to evaluate the problem as part of OSADL's consulting services (see below). Every OSADL member company may run one QA farm system per OSADL share free of charge. Every additional system is charged at 120 euros per month or, if booked for at least one year, at 960 euros per year (80 euros per month). The minimal booking time is 3 months (see Tables below). The fee for non-members is 600 and 400 euros per month, respectively. Please note that the given price information does not include taxes such as VAT. Do you already know which boards and processors you would like to have monitored at the OSADL QA Farm? If so, please use this Internet form to contact us!